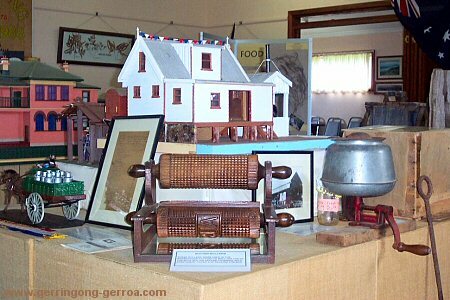 The Gerringong Heritage Museum contains a number of static displays featuring models and photographs of interest to historians and the general public alike. Of particular note are the intricate models of early Gerringong buildings constructed by Eric Wagstaff, the photographic record of motor racing on Seven Mile Beach in the 1920s, a display dedicated to Charles Kingsford-Smith and his take-off from Seven Mile Beach in 1933, geology and fauna display and a display about the local dairying industry. The museum was purpose-built and officially opened in 1991, and has wheelchair access and toilets. 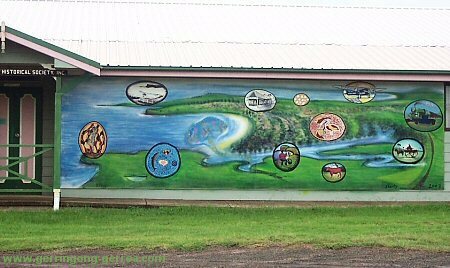 The Museum now has a wonderful Mural painted on the external wall. It was created by professional painters with input from the Gerringong & District Historical Society and local children. It depicts land and sea scape with cameos of early locations and activities, e.g. an aboriginal fishing from the rocks, the jetty at Boat Harbour, The Southern Cross aeroplane Kingsford Smith took off from Seven Mile beach to fly to New Plymouth in New Zealand in 1933. Horse and cart with milk cans, trees, stone walls, steam train, marine life etc.